One time when our group (acts2fellowship gold) went to Sierra Lodge last year, we made 20lbs of brownies for a late night snack! While making it in bulk, we stumbled upon the secret of making them really good. People liked it so much we finished it all (20lbs for 40 people or 5 servings each). Since then we made it a few more times and refined the process and made it for a few other events at Gracepoint Fellowship Church. 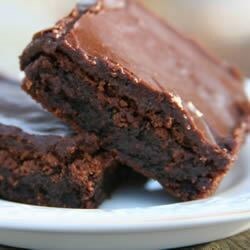 The result is moist, fudgy brownies with a rich chocolate flavor. You can use whatever brand you like. I personally like Krusteaz, but Ghiradelli is good too. Labor Intensity: Could do by yourself, but 2-3 helpers would be good. Preheat the oven as directed on the box. Grease a 13 by 9 by 2-inch pan(s) or whatever size pan you have. Pour all the dry mix into a large bowl. Pour the water, eggs, and oil into another container. Gently mix the liquids, but don't get it foamy. (I personally add a little less water than recommended, see end of post) Also use 1-2 eggs per 1lb box of mix. If it asks for more, add more yolk. Add the mixed liquid to the dry mix and stir slowly and carefully. I like to go along the side walls and fold it into the center. The mix should be to the point where there is very little dry powder. However, do not beat out the lumps. The mix should be very lumpy. It should look like a Nestle Crunch candy bar. Just mix the minimum amount to get it mostly hydrated. Pour it into the pan and place it in the oven. Check it 10 minutes before the recommended cooking time on the box. Put a toothpick in the center or a wooden chopstick and it should come out clean. In fact, I like it when it has a few moist chunks clinging onto the stick, just make sure it isn't watery. Check it again 5 minutes before and pull it out when you feel it's ready. I would recommend pulling it out a little too early when it looks moist and gooey, but not liquid. I spent a semester experimenting and thinking about how and what makes a good brownie. The 2 basic principles are (1) don't over mix it and (2) don't over cook it. (1) We had a hard time mixing 20 lbs of brownie mix and decided to just cook what we had and it came out well. Another time we decided to beat out all the lumps and mix it for 30 minutes on an electric mixer. That was the complete opposite of what we ate. Through this experiment we determined that mixing it too much contribute to gluten formation which would make the brownie bread like. I like brownies to be fudgy. (2) Most people overbake brownies. If you smell it from your living room, it's too late. The flavors are volatile and when you can smell them, they are released into the air and no longer in the brownie. That's why you should remove them early to keep the chocolate flavors in the brownie. That and you want to keep the brownie moist and overcooking would dry it out. The residual heat will continue to cook the brownie a little, so take it out just before it's ready. It will be ready by the time it cools down. Manipulating the ingredients could also contribute to the quality of the brownies. Egg (particularly egg white) will make the brownie cake like (or more appropriately bread like). Yolk will not affect it. I like to withhold one egg white when I make brownies in bulk. Also, beating egg white will make it fluffy like angel food cake. I will post on this in the future. I would use 1-2 eggs for every pound of brownie mix. If the box calls for more, you can reduce the egg whites, but keep the total yolks count. For example some mixes call for 3 eggs, I use 1-2 egg whites and 3 yolks. Next, I like to add a little less water. One time I accidentally added a little too much water and the mix became batter like. The result was a breadlike brownie. I think the excess water contributed to gluten formation. In addition, the excess water leaves in the form of steam. The steam is trapped (like the tiny pockets inside bread) in a process called "oven spring". If you add more water, you would need to leave it in longer to dry it out to the point where the toothpick is clean. This extra cooking time means more chocolate flavor is leaving the brownie.I like to reduce the water by about 10% give or take, judging by sight (this effectively means a spoonful or two) . I like to add the minimum amount of water to get it thick, hydrated, lumpy and then add a little more. Just follow the guidelines on the box for the rest. You may need to adjust it for high altitude. Actually Sierra Lodge provides the best environment since it has a convection oven which allows it to cook quicker and high altitude which means you need to pull it out faster. The result is a deep chocolate flavor in a fudgy brownie. I like a thicker brownie, which means more gooey soft insides, but a thinner brownie is good too if you like the chewy outside. Variations: There are many ways to modify the basic brownie recipe. You can add instant coffee to the mix for a richer flavor. If you substitute coffee instead of water, make sure it cools down. Don't add hot water. I like to add crushed pecans or walnuts to the mix. You can also spread on some peanut butter on top of the batter and swirl it into the wet mix. I particularly like a little of that. Another variation is to add fresh cooked caramel or fudge to the top (I'm not talking about the ice cream syrups, though you can use that too) halfway through the baking process. Another variation that some people like is to add crushed red pepper into the dry mix. I could go either way on it, but some people like it. I like to add chocolate chips, or even white chocolate chips into the mix. If you substitute butter for the oil, reduce water a little more. Butter has water in it and will increase the water content. I prefer oil as it doesn't mix into the batter too well and forms little micelle like packets. [Possible side dish] Milk and ice cream! Thanks Tom for your continual effort on this blog! Woohoo brownies! I think #1 tip is key - not mixing the brownie batter to death. I'm noticing that a lot of mixes (cupcake, pancake, brownie, cookie, etc.) are beginning to say "Do not overmix. Batter will have lumps" something like that or will even tell you how many times you should stir. And yet, people have this desire to beat out every single lump :)I also like to do cream cheese swirls, but sometimes I prefer this with a more cake-ish brownie... unless you like it really decadent of course! yeah it seems so counterintuitive to leave lumps in batter, but it actually ends up better. There are no dry packets of powder in the end. The cream cheese swirls sound good. Thanks for your post Tom! We really enjoy your brownies, and will try the recipe out when we come back from break. Tom, this is an amazing post. I remember those brownies as the best brownies I've ever eaten. I think I at about 5 lbs. of them. Tom, I just tried this technique on my brownies and they turned out so moist and fudgey! Great stuff! One variation on the typical brownie that a friend of my thought of is to bake the brownies in a muffin tin (filled halfway with brownie mix) until they're about halfway done. Take them out of the oven and press a chocolate candy morsel of some sort into the half-baked brownies (like twix or werther's or whatever you like). Then add cookie dough on top of the brownie mix and bake for about 10 minutes at the proper temperature for cookie dough. When the cookies are golden brown, the end result is: croonies! They're really good and taste awesome when served warm with vanilla ice cream.